It’s been a normal routine for most of the past two weeks, with the highlight being a very excellent Mother’s Day. First off, I had an early walk to Home Plate and waited in the car for my guardians to rejoin me after their breakfast. In the early afternoon we all went on an expedition to San Francisco’s Sunset District. The Sunset District is just south of the Golden Gate Park, a 15 or so minute drive. Sunset neighborhood names of Inner, Central, and Outer Sunset suggest a certain uniformity and the architecture is largely consistent. The street grid is east-west-north-south and the Pacific is the Sunset’s western border. At its widest point, the Sunset is around 50 blocks, almost 3 miles. In truth, there aren’t many stairs in the Sunset. 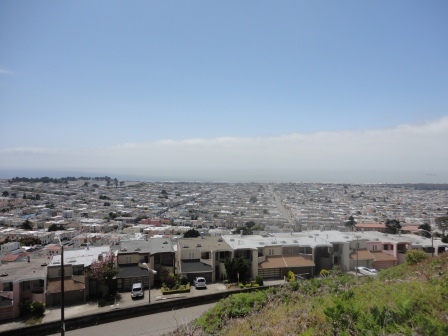 However, there is one good-sized hill in the area, and on Sunday we learned that it and its surrounding streets are a carve-out from the Sunset called Golden Gate Heights. The hill is called Turtle Hill and there’s a park on top, Grand View Park. That name is accurate! That’s me posing near the stairway bottom. Notice the fish! wonderful mosaics on the 163 steps. For the story, which is quite interesting, go to http://tiledsteps.org/Default.asp. In foreground, one block of Golden Gate Heights. Beyond is the Sunset & Pacific Ocean with fogbank. descended the many flights of stairs. Our next stop would be GGNRA’s Fort Funston in the southwest corner of San Francisco. Fort Funston is a favorite for all dogs – it’s big, scenic, and oceanfront with handsome sand dunes and a sandy beach. 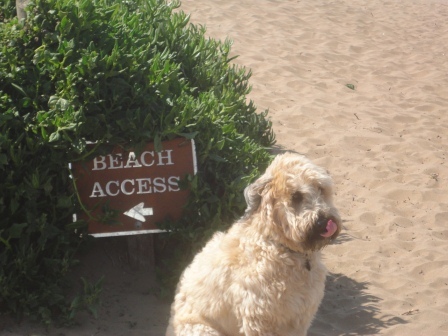 Most remarkably & importantly, the National Park Service doesn’t mind if my peers and I are off leash! At Fort Funston: I’d like you all to follow me! It was my first ever visit there and we had a long enough walk – although I met a lot of dogs, visits weren’t that lengthy since most of us were primarily immersed in the fresh air, views, and smells. Sounds like a perfect way to spend Mother’s Day! 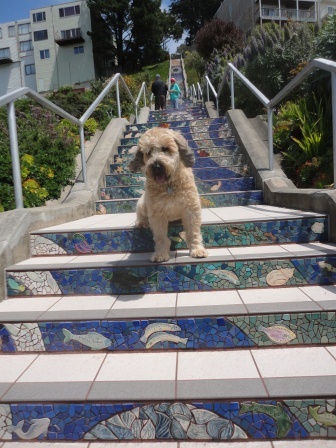 We love the Portland stairs, too. One of them will begin to get used by our family on a regular basis now that the weather is improving and the Farmers Market is open on Saturdays.